It's all about the minions! Despicable me is one of my favourite cartoons as I love dark characters that have a fuzzy heart. 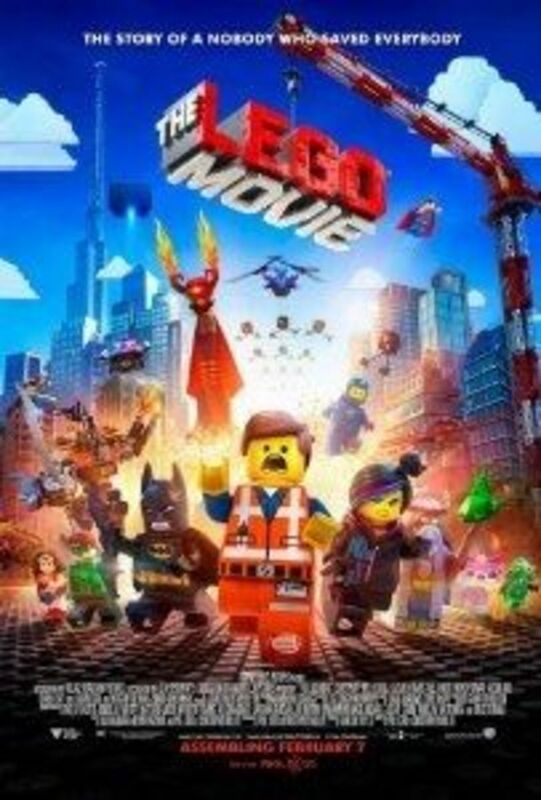 I was so excited to see that this animated movie is getting it's sequel. And now it's time to party. 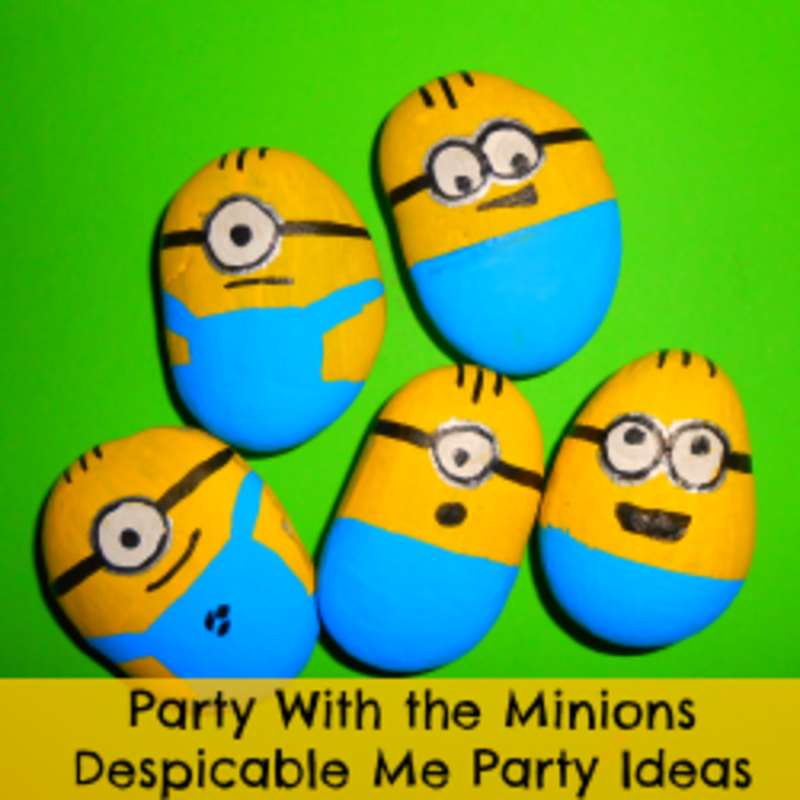 This is a fun theme and I want to share my ideas on how to throw a perfect Despicable me party as well as help you find the best supplies for this one (or create them). There are lots of fun games you can adapt for this theme and I am even sharing some free printables that will hopefully be of use to you. 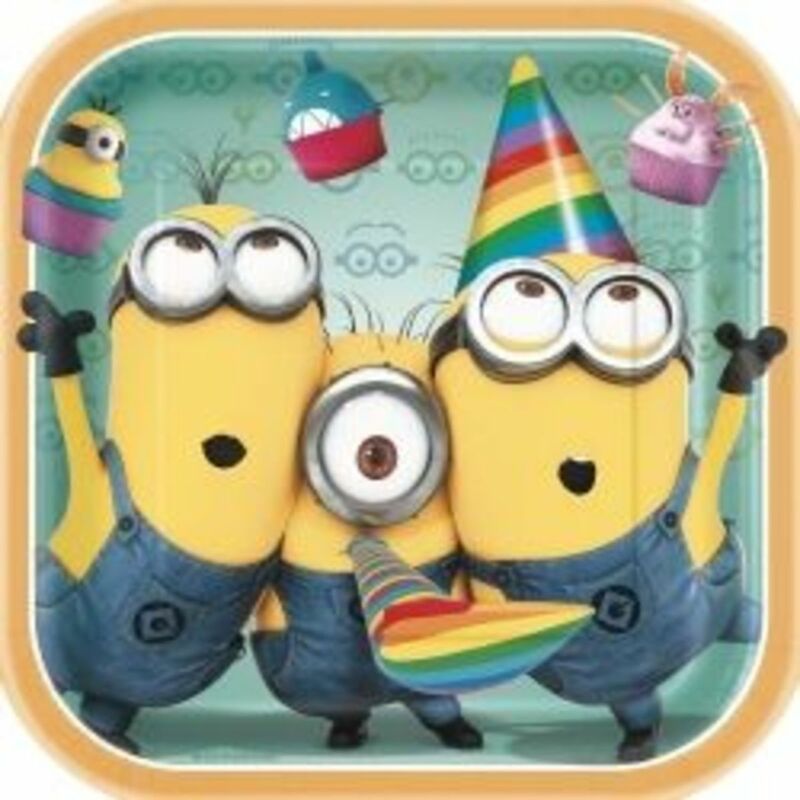 So let's party with the minions. Photo Credit: Photos on this page are taken by me unless stated otherwise. Finally party supplies for the second movie have arrived and they look adorable! The designs exceeded my expectations by far. While I do like Gru and the girls a lot I really like the fact these supplies are all about the minions - they look way more fun and they are ready to party! There are two designs you can get - one where they are squeezed close to one another and are having a blast with their party blowers and cupcakes (the pink rabbit cupcake is adorable) and the other where two of them are throwing the third one in the air. These are just some of the supplies! Sip your favourite beverage from these nifty cups! 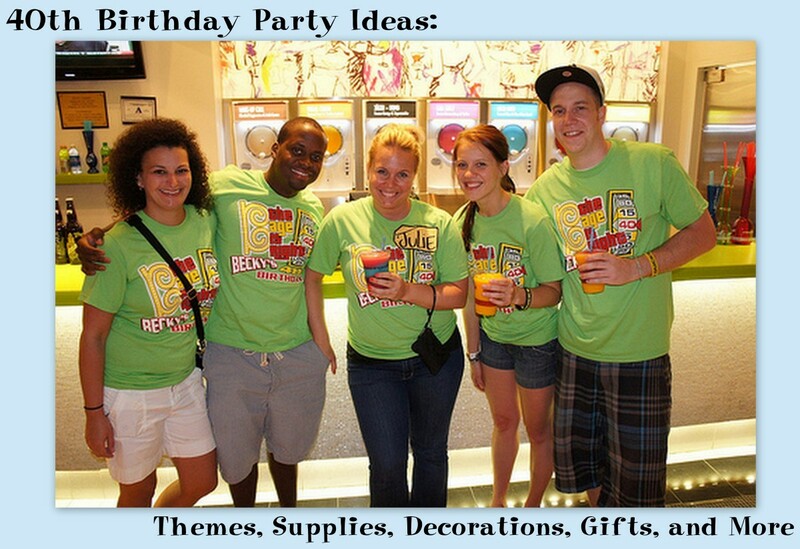 What better way to start planing a party than having themed party invitations? I thought about decorations I could make that would be easy, fun an miniony (I made up a word). Balloon minions! A fun idea for a centrepiece or as a decoration. You could make a whole army of them and have them all over the place. I used yellow balloons in different shapes (I even used water balloons), blue cardstock paper, white paper. First I blowed the balloons. I cut the blue cardstock paper in strips and secured them with duct tape on the balloons. I draw the googles on the white paper (I used a permanent marker and silver glitter gel pen), cut them out and glued them on the balloon. I draw the finishing touches (mouth and hair) with a permanent marker. Can't have a party without balloons! Yellow ballons will be perfect for this theme (you can even mix in some blue ones). 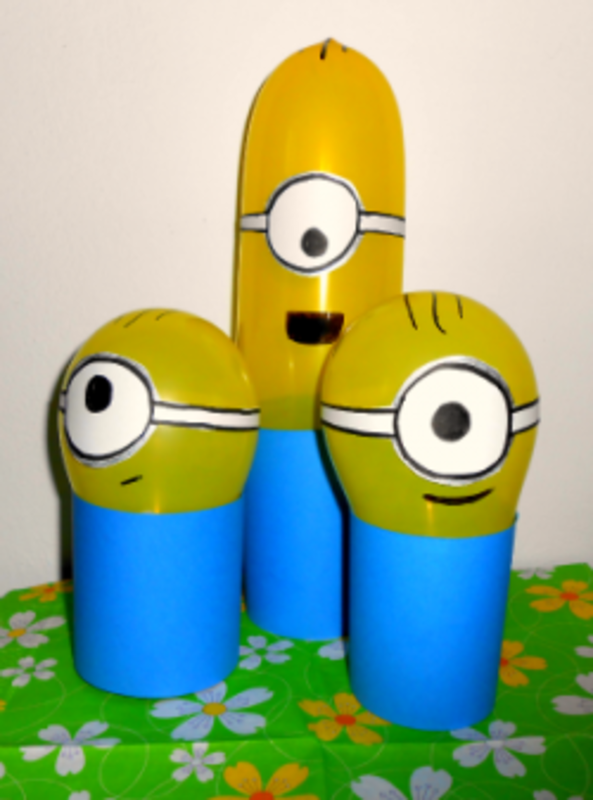 You can make the minions the way I did them or just draw or glue on the goggles. 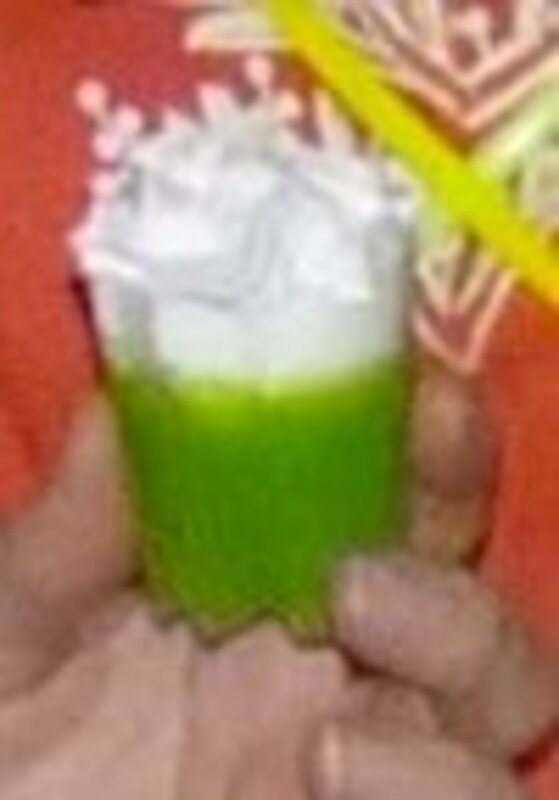 You could also get these. The cake topper for the movie is here! Let the beach party with the minions begin! 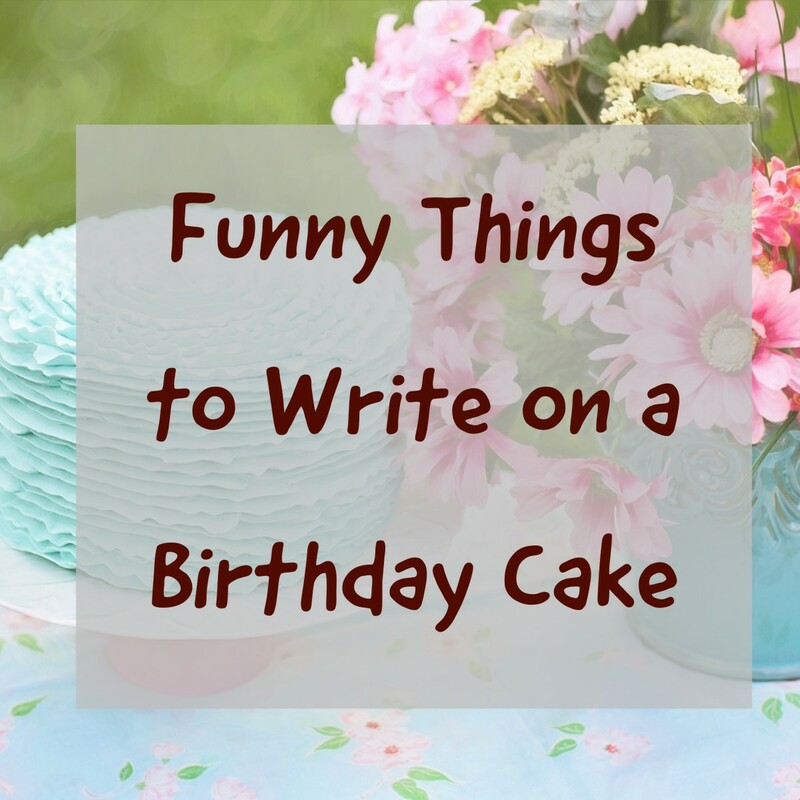 Don't want to mess with the cake too much but still want it to look pretty? 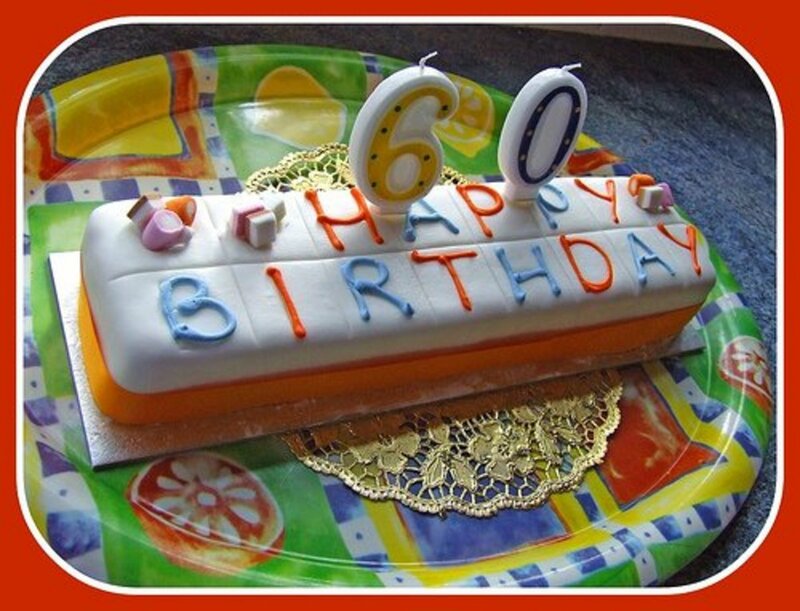 Edible cake topper to the rescue! Official minion cupcake rings! These will look great on cupcakes and kids will be able to keep them! Cake pops might look like a lot of work but they don't have to be. You can make a lot of short cuts if you use Edible Color Markers . 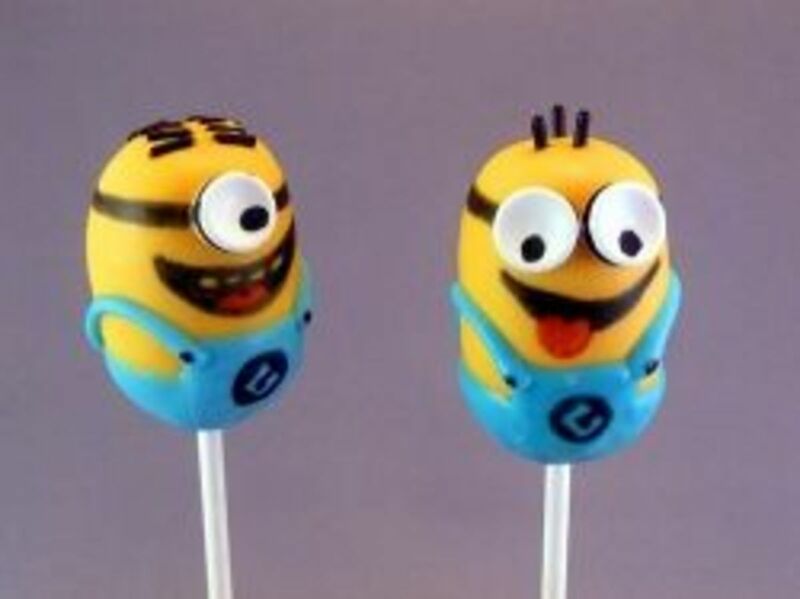 To make simple Despicable Me cake pops you prepare the basic cake pop mix and make the balls (they can be round or oval), dip them in yellow candy melts, dip them in half in blue candy melts and draw in the details with edible food pens. Easy! You can make the cake pops a day before the party as the candy melt coating will keep them fresh. 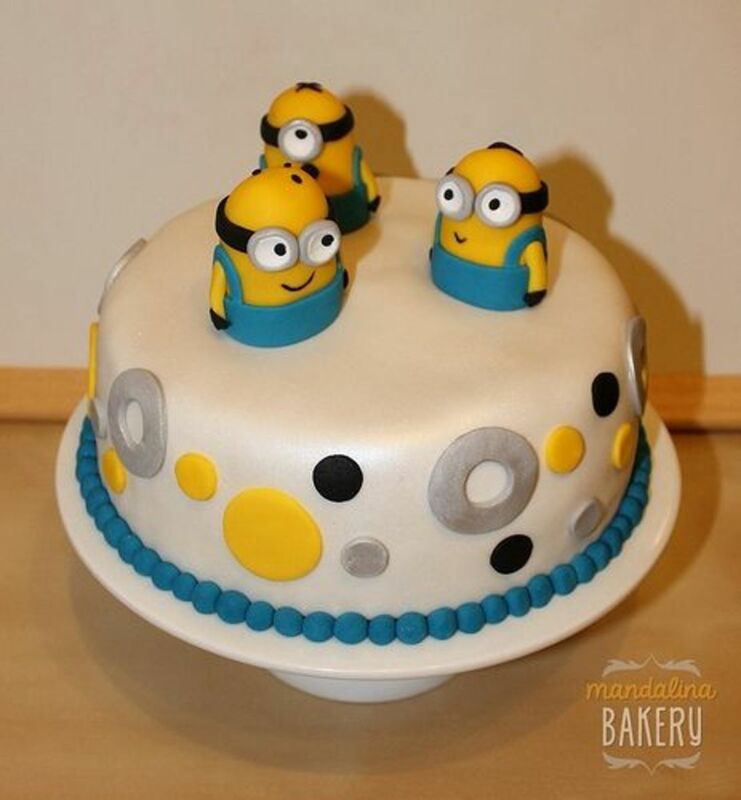 Host the party in Style - Dress Up as Gru or the Minions! @anonymous: Thanks! I really do enjoy planning (and attending) parties. 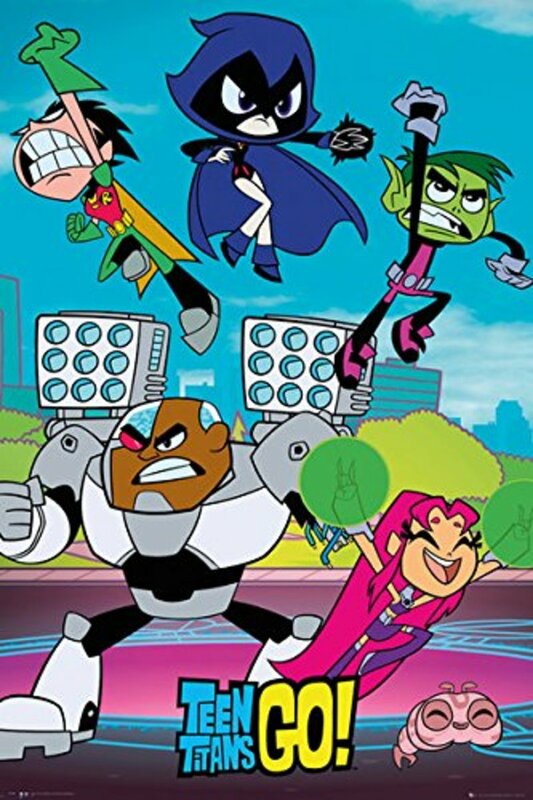 You have some really great outstanding pages for themed parties! Some of the best that I have seen!